I wake up to sunshine! The first sunshine since I arrived on this island….! I arrive at the camp around 9am. The boys are already out and about training. Today they are all wearing their “official” t-shirts. 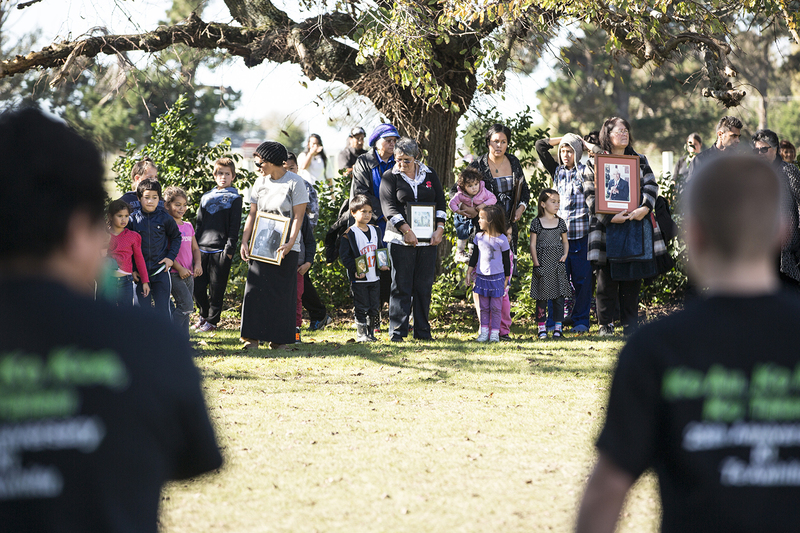 It is the 25th anniversary of this wananga and today they are holding a death ceremony. I have to admit they all look very smart in their black shorts and black t shirts with green and white writing on it. The instructor is taking their haka apart, going through it bit by bit. At some point he is splitting all the boys in two groups and has them “battle off” their haka, stating which side is stronger. The junior instructors keep yelling that the older back row should be louder and reach to the front cause the younger boys in the front don’t all know the words and movements yet. They have to carry the group from the back. I hear a few times that this does not sound like a haka…. Be louder, apply yourself! Around 10am people and families start arriving for the ceremony of the dead. Chief does his “welcoming of the deceased, acknowledge their presence of many years – they are the foundation of what we are today.” Ceremony: KAWE MATE. They stand outside the boundaries and wait. The boys get more nervous, you can feel the tension rising. In the meantime, chief and some of the students set up the altar. 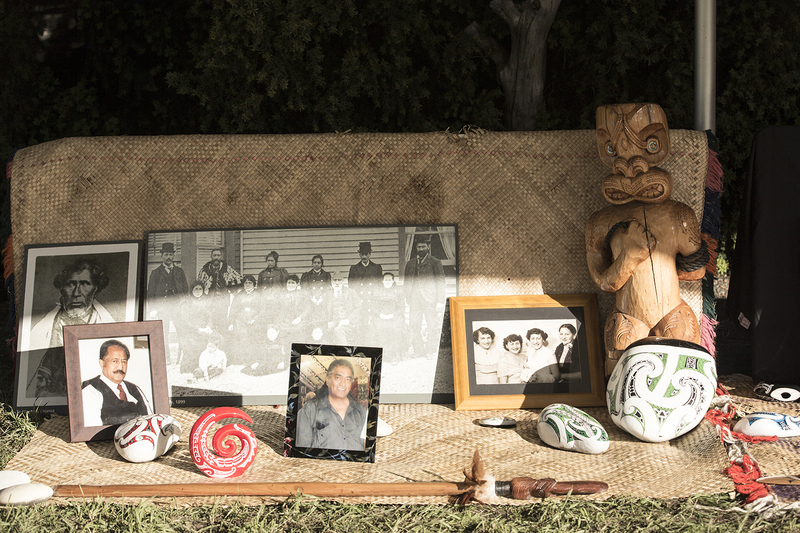 There is a statue, the painted stones, a taiaha and a few old framed photos (ancestors). Ceremony starts. The people come inside the “circle”. 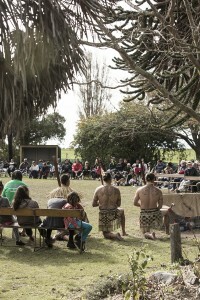 The boys perform their haka – full volume as much as I can tell. I haven´t heard them that motivated since I got here. They are all very much into it, giving it all they have, as well as they are able to. It is quite incredible how much the voices of the few older boys (young men) carry. They truly sound like warriors. Suddenly a haka/singing erupts from the viewer ranks. A few older men are “challenging” the boys? The boys grunt and do their noises, stay put. Then Jade and three instructors perform the challenge. They are dressed like ancient Maori warriors in their gear. It is all serious, and sincere. This is not merely a display for tourists, this is a tradition. 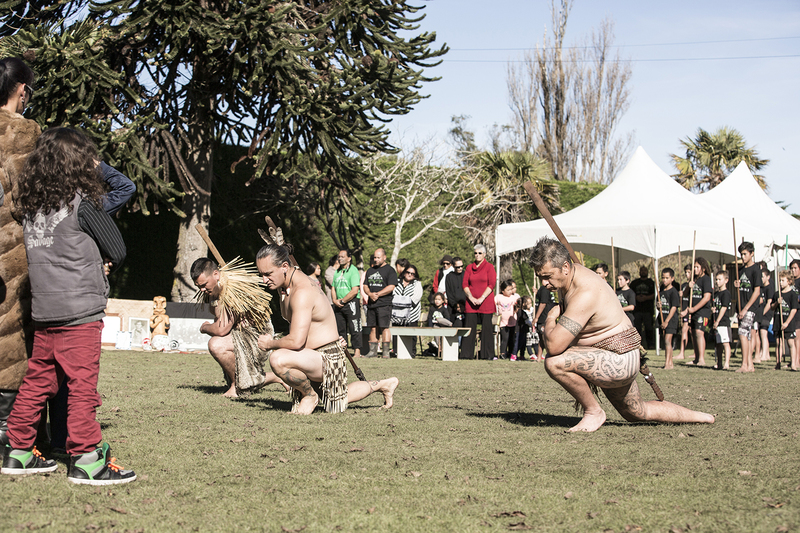 After the challenge, The families follow the three warriors and proceed to the altar, place their frames down, accompanied by the haka of the boys. Then chief has a long talk, where he talks to the deceased as if they were here (because they are as Jade explains). At some point three other men from the families take the word. Talk for a long time. Jade explains that there has been a split in the tribe. And that this first man has come to “apologize”, mend things. And that this is very important for them. They are so few, they should not be fighting amongst themselves. They should be a unit. Jade also explains that it is a bit silly wanting to unite all the Maori cause the tribes are so different that you could almost compare them to Italy, France, Switzerland… it’s like putting all these countries in a pot. 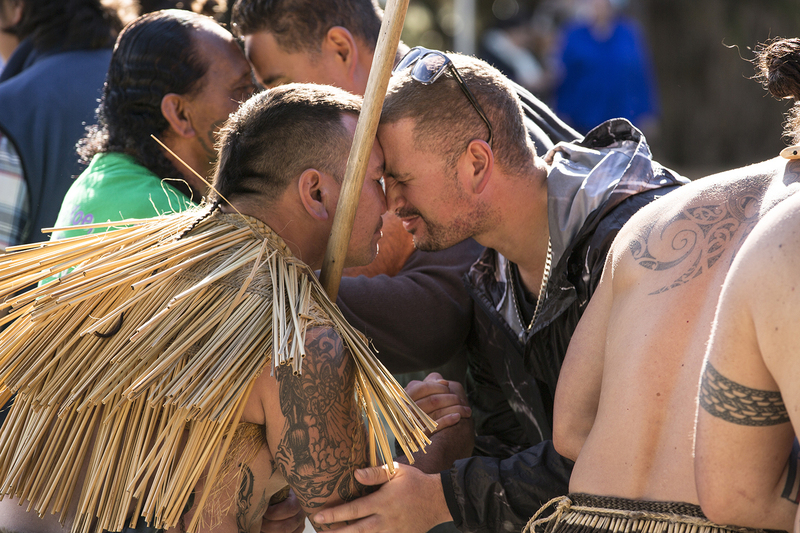 There is a lot of talk, some exchanges, a taiaha is given to the chief….. and then the boys show off in some competitive games. One includes the poi, some includes running…. there is another one where younger boys pick a junior instructor and are handled like a taiaha…. you can tell how much the little boys love their older junior instructors. Also what strikes me is that during the play, when a boy gets hurt, they don’t hide it. They openly show they are in pain, even cry. Some other boys will come over and stroke their back, hold their hands, hug them… they hall help each other out. Even Jade starts crying when telling me that one of the deceased is the daughter of a close friend. those are real warriors. They don’t mess around. But they are warrior enough not having to hide their emotions. I am very impressed. 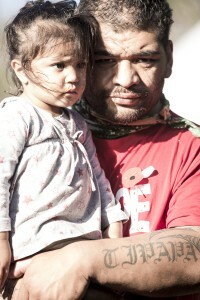 Story about the word Maori. Story about Japan (its in notebook). 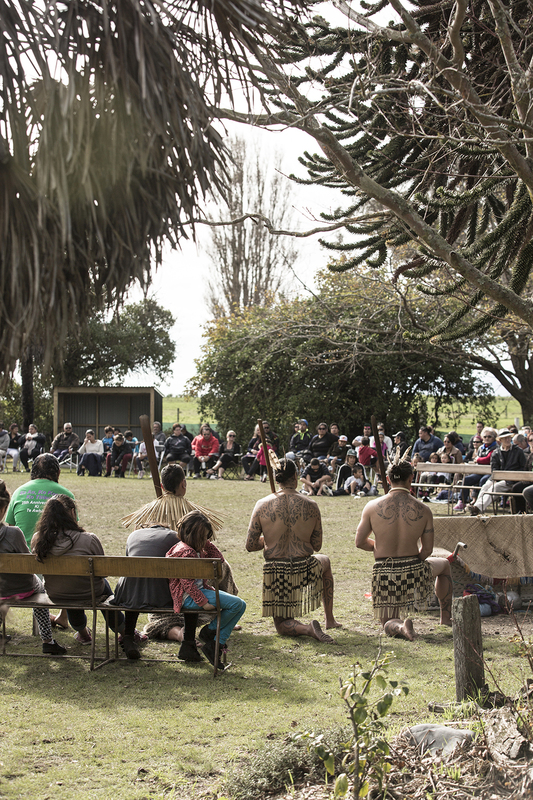 Everyone shares a meal – hangi- after again the marquee is moved to protect the ancestors, haka is sung…. first guests, boys have to wait last to get food. By then it’s already 3pm and they must be starving. They haven’t had a break since I got there….